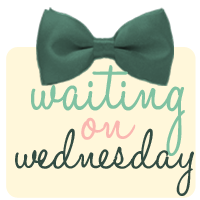 Each week Books and Sensibility participates in Waiting on Wednesday, a meme hosted by Breaking The Spine that spotlights upcoming releases that we're eagerly anticipating. I found this book after reading this blog post where Beth discusses the important impact of book bloggers on authors and this book in particular. Of course, now the novel is sold out on Amazon.com so looks like I will be waiting on it for a while. Synopsis: The riveting stories of Emmy and Sophie—alternating narratives of loss, imprisonment, and freedom regained—escalate with breathless suspense toward an unforgettable climax. Denise just released the cover for this book and it really caught my attention. The plot seems like a good contemporary story. So, what are you all waiting for, I'm super curious ! They both sound emotional for very different reasons. Good picks! You picked really nice books. It's my first time to see the cover of Never Enough and it looks really good. I am still starting to like contemporary YA but I think I'm going to like that book. I'm still yet to read a Denise Jaden book, so this one might change that! Great picks! I love YA Contemps! Both look and sound good so I can't wait for these either. A lot of people loved You Are My Only. I hope you get them and enjoy them. Come check out my WOW over at Livre De Amour-Books of Love Blog. Both of these sounds really interesting. They are new to me. Great choices! Everyone is so stoked for You Are My Only and I must say I'm right on board with the hype. It sounds... crazy. Thanks for stopping by. Both sound so good, great choices! I am definitely adding both to my list. I recently read You Are My Only and really enjoyed it. Kind of weird, kind of sad, but really interesting. I hope you enjoy it when you get to read it! love the one and only cover! Never Enough sounds amazing, I came across that one a few days ago and had to add it to my list. I've heard quite a bit about You Are My Only too. I've got You Are My Only on NetGalley. I love the premise of that one. Never Enough sounds amazing too. It kind of reminds me of I'm Not Her in some way. Great picks! Yay! I love You Are My Only! Last I checked it was actually in stock at Book Depository and there's not shipping fees there, so I'd give that a shot. I hope you enjoy it!